This second adjudicator was picked by Fantino himself, I for one am happy that Fatino was successful in getting the first adjudicator tossed off the internal hearing! It's not such hysterical nonsense now is it Julian! 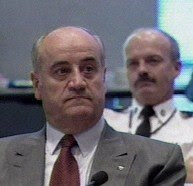 TORONTO — Ontario's top police officer, Julian Fantino, lost a second legal bid Tuesday to have an adjudicator he accused of bias thrown off an increasingly messy disciplinary hearing. A three-member Divisional Court panel unanimously found retired judge Leonard Montgomery had behaved reasonably, and the judges rejected accusations of impartiality from Fantino, the commissioner of Ontario Provincial Police. "The adjudicator and counsel are professionals with well understood responsibilities that are informed by the duties that apply to officers of the court," the court said in its 30-page decision. "The reasonable expectation should be that the work of the tribunal will go forward in a proper manner." The court also dismissed the argument that Montgomery could not stay on the case given Fantino's complaints against him. "If, in such circumstances, a suggestion of this kind could succeed, it would imply, at least potentially, that a party to proceedings could attempt to remove an unwanted judicial officer by bringing a complaint of bias ... regardless of whether the complaint succeeded or not," the court ruled. "That would be inimical to the proper working of the justice system." It was Fantino's second failed attempt to get the courts to force Montgomery to recuse himself in the long-running case involving two senior police officers charged under the Police Services Act with misconduct. Their lawyer Julian Falconer maintains Fantino was being petty and vindictive in laying the charges. He argued the recusal motion and subsequent court battles were simply Fantino's attempt to derail his cross-examination. "This is a sad example of where endless legal resources can take a proceeding," Falconer said after the court ruling. "It's my hope that cooler heads prevail and that we simply resume the hearing." Fantino's current lawyer Tom Curry was not immediately available to comment. In November, Fantino's prosecutor at the disciplinary hearing asked Montgomery to step down. In doing so, Brian Gover also said he would take the matter to court if the retired justice did not do so, and insisted the province's attorney general supported him. An angry Montgomery refused to step aside, calling Gover's comments a "highly improper" attempt to intimidate a judicial officer. The Divisional Court said Montgomery's reaction was "reasonable." The panel also rejected Curry's assertions the adjudicator had shown hostility to the prosecution on several occasions, including once when Montgomery said he was "upset" after Fantino changed an answer he had given earlier. The court called Fantino's response "gratuitous." The labyrinthine disciplinary hearing involves two former members of the provincial police internal standards bureau. They are charged in relation to an investigation they conducted into how officers responded to a domestic violence complaint involving an officer and his estranged wife almost five years ago. But the case has instead ensnared Fantino, with the defence accusing him of witness tampering. Falconer was delighted with the Divisional Court ruling. "My clients deserve this," he said. "They simply want to get back to the hearing and have this matter put behind them.